Prominent & Leading Manufacturer from Moradabad, we offer mosaic candle holder, mosaic bowl set, glass mosaic heart, large mosaic vases, metal mosaic vases and mosaic cake stand. 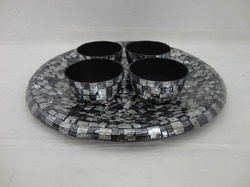 We offer high quality Mosaic Candle Holder to our valuable customers. 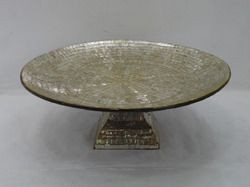 Made from cent percent metal, the offered products are widely used for different decorating purposes. Available with us at cost effective market prices, the offered holders are known for their alluring appearance, portability, and stylish design. To ensure delivery of defect free holders, these undergo various predefined quality tests by our highly experienced quality controllers. 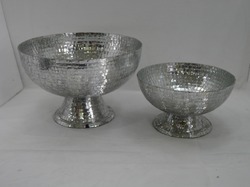 We hold expertise in offering Mosaic Bowl Set to our esteemed customers. The offered bowl set is high in demand in the market for its light weight, corrosion resistance, fine polishing, and elegant design. The quality controller keeps strict vigil over the entire mosaic bowl manufacturing process, to ensure that it is carried out in compliance with industry set standards. 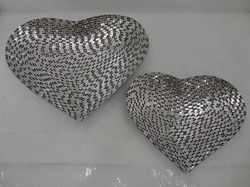 Our organization is engaged in offering superior quality Glass Mosaic Heart to our prestigious customers. This holder is manufactured from finest quality aluminum, which is obtained from well-known vendor. The offered holder can be used in home, office, or religious places for the purpose of holding candle. 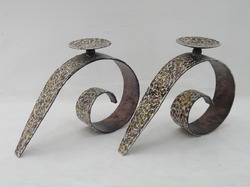 Moreover, the offered holder is commonly used for various decorating purposes by our customers. 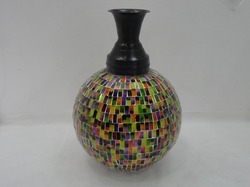 We are one of the leading manufacturers and exporters of a wide assortment of unmatched quality Large Mosaic Vases. Manufactured using latest machinery, the offered vases are known for their flawless finish and attractive designs. Precisely designed as per the industry standards, the offered vases are widely used in different decorative application. The offered vases are delivered at clients’ end within stipulated time constraint, due to sincere efforts to the logistic professionals. 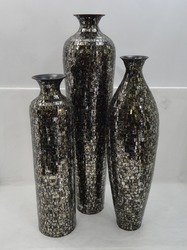 Owing to the vast experience in this domain, we have been able to offer a wide variety of high quality Metal Mosaic Vases to our prestigious customers. The offered products are widely used for decorating interior of different hotels and restaurants, due to their attractive design and fine finish. These vases are crafted from finest quality metal, which is obtained from trusted vendors.